Consolidation is the keyword at Acura nowadays. As in merging the compact TSX and the midsize TL sedans into the all-new TLX luxury sports sedan. Placed between the ILX entry sedan and the flagship RLX, we must admit that the result is remarkable. Powertrain choices are a 2.4-liter inline-4 cylinder (200 hp) or the 3.5-liter direct-injection V-6 engine putting out 290 horsepower (up by 10 from its predecessor) @ 6200 rpm and 267 pounds-feet (increase of 13) of torque @ 4500 rpm. The previous 6-speed has been discarded for a 9-speed gear box – an electronic push-button gear selector instead of a shifter knob. The unit-body TLX is offered in front-wheel as well as Acura’s renowned Super-Handling All-Wheel-Drive (SH-AWD), which distributes power not just between the front and rear wheels but also the left and right rear wheelsThanks to the Integrated Dynamics System (IDS), eco, normal, sports and sport+ settings are offered. Looking to save fuel? The Variable Cylinder Management (VCM) system operates in three or four cylinder modes for substantial fuel savings. Compared to its predecessor, the TLX has shrunk in length by 3.7 inches, width by 1 inch and height by .2 inches. Attention-grabbing jewel-eye LED headlights convey a powerful and athletic stance. The cabin is straightforward as Acura has done away with unending buttons and controls that previously cluttered the dashboard. Instead, you have two 8-inch navigation and 7-inch touchscreens. The easy-to-use central control dial takes care of audio, navigation, phone systems. Directly in front of the driver are large analog instruments for the speedometer and tachometer, fuel and coolant temp readings with a centered driver information center. The cavernous trunk can gobble up 14.3 cubic feet of belongings. Other standard niceties include dual-zone auto climate control, perforated leather seats, 10-way power and heated driver and eight-way front-passenger seats, power moon roof, and a 60/40 split rear seat. Dual front and side airbags, side curtain airbag, driver knee airbag, four-wheel antilock brakes, front/rear crumple zones and parking sensors, vehicle stability assist with traction control, lane departure and forward-collision warnings and lane-keep assist (which maintains the ride in its path), blind-spot monitor, collision and road-departure mitigation systems, hill-start assist, rearview camera, daytime running lights and tire pressure monitoring system are standard. Our kudos goes to Acura for successfully blending the TSX/TL into a graceful, energetic and enjoyable driving experience with an elegant interior that rocks. Unlike in the past, the all-new TLX should prove to be a tough contender. Let’s rattle off some minivan names: Toyota Sienna, Honda Odyssey, Dodge Grand Caravan, Chrysler Town & Country. And lest anyone forgets – Kia Sedona. No kidding! 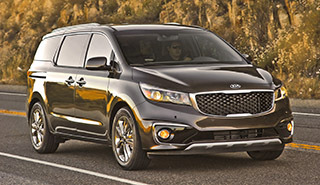 Annual sales of the Korean automaker’s minivan may be dismal but that doesn’t mean the Sedona is less of a minivan. In fact, a total redesign in 2015 makes the family hauler, offered in five trims, even more tempting. The previous 3.5-liter V-6 engine has been replaced with a 3.3-liter gasoline-direct injection power train, same as the one found in the Sorento SUV and the Cadenza luxury sedan. Also, the wheelbase is up by 1.6 inches. The front-wheel-drive Sedona pumps out 276 horsepower @ 6000 rpm and 248 pounds-feet of torque @ 5200 rpm while mated to a 6-speed auto transmission. The drive mode selector allows the driver to pick comfort or eco. You would rarely hear anyone call a minivan good looking but the Sedona is just that. Perhaps, it is the most appealing visually among the competition. Projector headlights with LED positioning lights flank a massive mesh grille with chrome surround to portray a handsome appearance. The cabin is spacious and functional with a tri-zone auto climate control, rear a/c, Nappa leather seats, dual glove box, tilt/telescopic steering column, heated/cooled front seats, Infinity surround sound system and power tailgate. The dual power-sliding doors open up to lounge seats with footrests for second-row passengers while the third-row 60/40 split seats folds into the floor. With both rear seats folded, you get an impressive 142 cubic feet of space. Standard safety amenities include dual front and side airbags, side curtain airbag for all three rows, front active headrests, vehicle stability management, electronic stability and traction control, hill-start assist control, roll-over mitigation, cornering brake control, four-wheel antilock brakes with electronic brake distribution and brake assist, front/rear park sensors, remote keyless entry, daytime running lights and tire pressure monitoring system. For far too long, the base-priced $25,900 Sedona has been the black sheep of the minivan family. With the redesign, this reliable and overlooked ride should receive serious attention. After all, the spacious passenger- and cargo-hauler boasts a solid and safe ride and decent fuel economy. This one defies any category. However, it’s been termed a “microvan” for being smaller and cheaper than regular minivans. Sharing its basic design with the compact Mazda3, the midsize Mazda5 continues as is in the 2015 model year. Its base Sport, mid-level Touring and up-level Grand Touring share a common power train: 2.5-liter DOHC inline-4 cylinder developing 157 horsepower at 6000 rpm and 163 pounds-feet of torque at 4000 rpm. Only one piece of bad news for stick-shift enthusiasts: the 6-speed manual gear box has been axed. The 5-speed automatic is the only transmission available. It’s rightly for flexible and practical purposes that the six-passenger Mazda5 has an edge over its rivals. Take the minivan-like, rear-sliding doors for easy entry and exit to the cabin. The second-row seat reclines and slides fore and aft so children so slip into the 50/50 third-row seat, which when flat, nets you 44.4 cubic feet of cargo space. Storage areas are ample such as hidden trays under the second-row seats and cargo hold, flip-and-fold-out tray table, glove box, front center console and coin holder. Leather on the seats, shifter knob and tilt/telescopic steering wheel, auto climate control, power windows, door locks and moon roof, remote keyless entry and a trip computer are a few of the standard conveniences. Launched as a 2006 model, the nimble Mazda5 flaunts plentiful cargo and passenger capability, decent fuel mileage and affordable price. The result is a remarkably valuable package. And if it’s dubbed a “microvan,” so be it! The 2015 North American Car of the Year truly deserves the title and honor. Indeed, the VW Golf along with its counterpart GTI sets fresh benchmarks in innovation, design, value and available driver assistance features. Our test-drive Golf TSI was equipped with a 1.8-liter turbocharged inline-4 cylinder engine (replaces previous 2.5) generating 170 horsepower @ 4500 rpm and 200 pounds-feet of torque @ 1600 rpm. It is mated to a 5-speed manual gear box though a 6-speed auto is available. You are assured that the sprightly and stylish Golf will get up to speed with urgency, and slow down as quickly and with self-assurance. For 2015, this seventh-generation hatchback is longer (2.1 inches), wider (.5 inch) and more spacious than its predecessor. Based on the MQB platform from Volkswagen, the front wheels have been moved forward by 1.7 inches, allowing more flexibility. It is also lighter by up to 79 pounds, depending on the model, with height down by 1.1 inches. Exterior changes include a steely sloped and longer hood, shorter front overhang, narrower grille and headlights to result in a lower but more dynamic stance. Cabin passenger volume is 93.5 cubic feet of space, up by .8. Shoulder room increases by 1.2 inches in front and 1.1 inches in rear. Trunk space is 22.8 cubic feet and if you fold down the rear seat, you get 52.7 cubic feet. Occupants will find the new 5.8-inch touchscreen infotainment system user friendly. Other standard amenities include power tilt/slide panoramic sun roof, single-zone manual climate control, 60/40 rear seat, and a leather-wrapped tilt/telescopic steering wheel, shifter and brake handle. 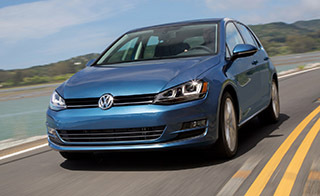 Starting at just $20,995, the Golf S is a lot of compact car for the money. The peppy and supple ride eked out an impressive average of 30 mpg in city/highway driving. Besides, the potential buyer is promised sufficient power and abundant space. Without any doubt, this VW deserves the North American Car of the Year mantle. About 86 miles. 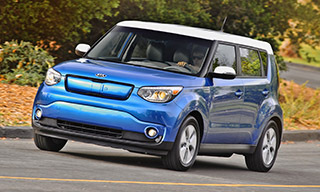 That’s the distance we were able to drive on a full tank of … Err, forget gas, since the all-new 2015 Kia Soul Electric Vehicle (EV) runs solely on an electric motor and battery. However, EPA estimates put the full charge battery range at 93 miles. Regardless, we must hand it to the Korean carmaker for equipping the quirky and lanky hot-seller with all-electric gear. The hatchback is powered by an 81.4 kilowatt electric motor along with a 27 kWh lithium-ion polymer battery that’s warrantied for 10 years/100,000 miles. The outcome is 109 horsepower and 210 pounds-feet of torque. A single-speed gearbox provides satisfactory feedback. And the ride comes in B (for regenerative braking) and D (normal driving) settings. There also is an eco button to eke extra mileage. Standard safety features include dual front and side airbags, side curtain airbag for both rows, four-wheel antilock brakes, Vehicle Stability Management, stability and traction control, rearview camera, front seatbelt pretensioners, front/rear crumple zones, side impact door beams and tire pressure monitoring system. The EV has retained the boxy and odd-looking shape of its gasoline-powered twin though a distinguishing feature are dual ports behind the sliding doors in the larger grille. With the on-board 6.6 kW charger, you can put life into the Soul at home. On a 120-volt system, you will need 24 hours to fully charge the battery; a 240 volt will do the job in 4 to 5 hours. However, on a 480-volt fast charger, it will take just 33 minutes. The portable charger can be stowed in an under-floor cargo tray. Certainly, the coolest cabin trait is an energy-use monitor on the 3.5-inch instrument cluster showing power, eco guide and charge status via colored bars. Also useful is the EV button on the 8-inch touchscreen, which pulls up nearby EV charge stations, allows you to set charging/climate times and shows remaining charge percent on the battery. The extremely frugal folks will love the virtual plant that sprouts leaves. The more heavily one steps on the pedal, the fewer leaves will develop, making you see anything but green! Also notable are three illuminated blue lights atop the dashboard showing battery status during charge. Other standard goodies include leather, tilt/telescopic steering column, heated/cooled front seats, 60/40 rear fold seat and cruise control. Base-priced at $33,700 (apply $7,500 federal tax credit so total is $26,200), the Soul EV is an admirable first-time effort. Of course, the off-beat appearing ride now transforms into a city commuter, making long-distance travel virtually impossible. But then, as they say, a journey of a thousand miles must begin with a single step. And Kia has joined the rest in taking that first stride.